I couldn't help but notice the few posters on this site since the first of the year 2013. BUT. Here goes anyway. I am a proud second owner of rust free 83 Cherokee Laredo WT. A barn find found last July in Flint Texas. The last inspection sticker expired in May of 98. Wagon was bought new from Jim Allee Olds, Dallas TX. I made a color copy of the original Texas Title. I have insured the Wagon and Tagged it as a Texas Antique Auto. So far it drives out great. 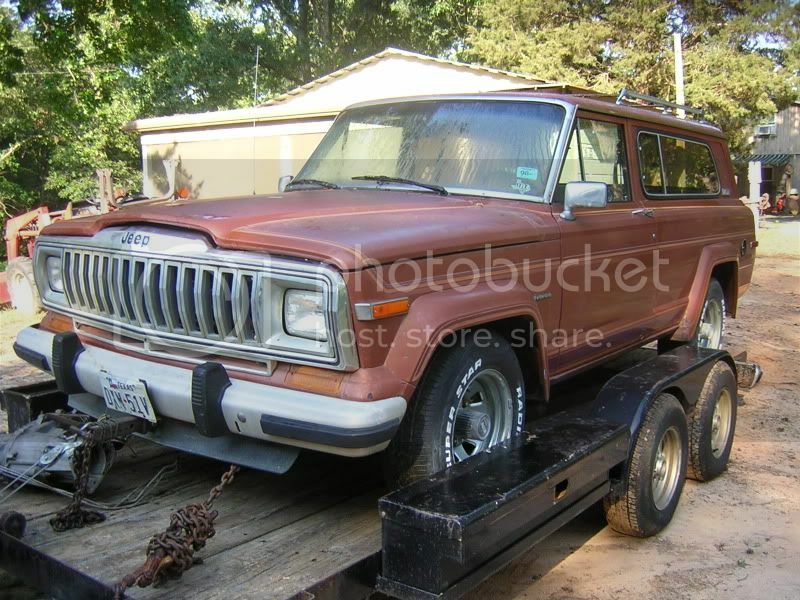 I'm in the process of a Restoration/Renovation with the intent of adding value to this collectable classic The last of the FSJ Cherokees built was in 83. Left rear quarter and taillight assembly was crunched pretty bad. Rear (Aluminum) bumper got bent and straightened. 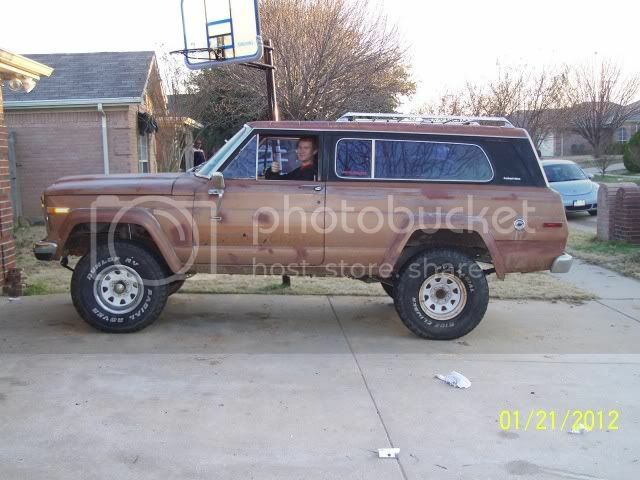 Pretty good but I replaced it with a nice one along with a rear quarter off of a 4dr Wagoneer. Both rear sidelights are now the wraparound Wagoneer style. New brakes all around. Front Axle rebuild. Changed and Topped off all fluids. New belts and hoses. Ordered a Transfer Case Seal kit. Wagon came with a complete extra used TC just in case. Replaced the broken rear tailgate window electric switch. Wagoneer rear door switch with pigtail plugs right in. Bugged out the selec-trac and the 4WD works. All new Power steering parts. Door locks have a mind of their own. Kinda spooky. PO installed a Holly Projection soon after the Jeep was bought. I bugged it out and was by trial and error able to tune it to my satisfaction. Wagon came with 2 spares of almost everything except the fuel pump. Starts great, idles great. drives out without hesitsation. Fuel mileage seems to be less than desired but until they pass a law that parks all gas hogs it's ok. The rain gutter trim is yellow and cracked plastic. Also the pinch weld seam trim around the back glass is plastic. I think early Cherokees and Wagoneers had Stainless trim. Be looking for a set of this stainless trim for me please. Got a little over 4 thou including the 1500 purchase price invested so far. Remember. It was not running when I got it home. When I look at Wagonmasters Kerville website and see what you get for the money I'm OK with my expenses so far. A pretty redish orange 28 thou Chief is in the shop in Longview now for a complete engine rebuild. AC will be the last item on the list of things to fix. Anybody else got any FSJ stories to share. 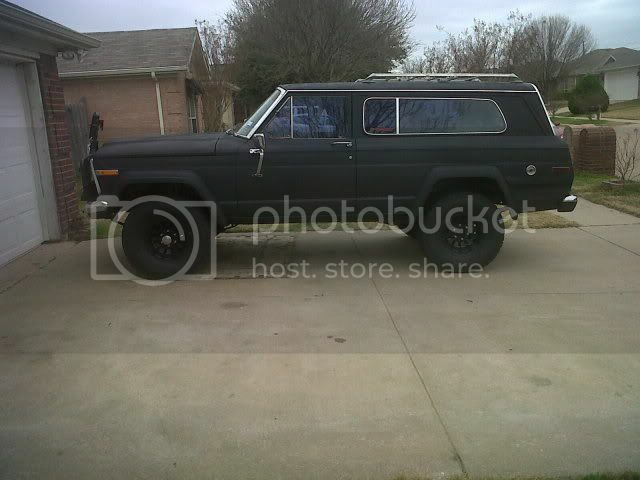 I had a couple Laredo Cherokees and loved them. I did a lot of hunting and city driving and those Jeeps were awesome for just about everything but gas mileage which I never really worried about as I never bought a Jeep thinking about gas mileage. Do you have some pics to post of your rig? Hello. Is anyone home. Where did you go Elliot? That's sure a clean looking Cherokee! 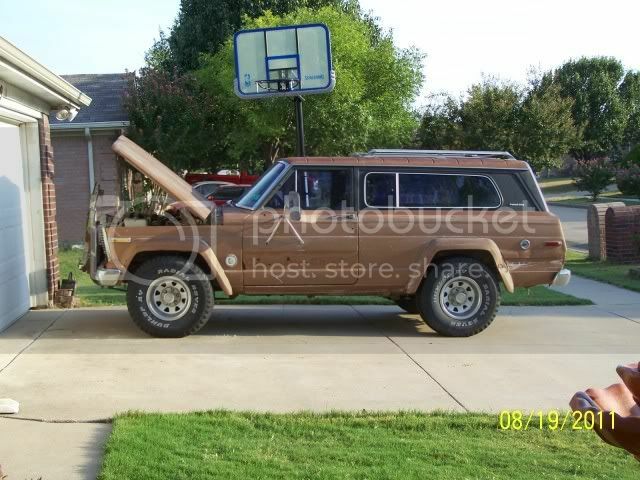 1983 Wagoneer Limeted, 169k 360 AMC, NP 229, 727, No mods Yet!!!!!!!!! Aug 2011 we drug home a '79 Chief. By X-mas of '11 the TANK had a legit inspection and was on the road. The last sticker was '97. After putting floors back in and grafting in seats from an '86 IROC/Z28, we were no longer looking thru the floors. Had trans rebuilt in early '12 then started to upgrade parts as they needed replacing. RC 3.5 springs fixed the sag as we all know developes after 25+ years. Steels were changed out for Waggy Alus that were treated to Satin Black powder coat. 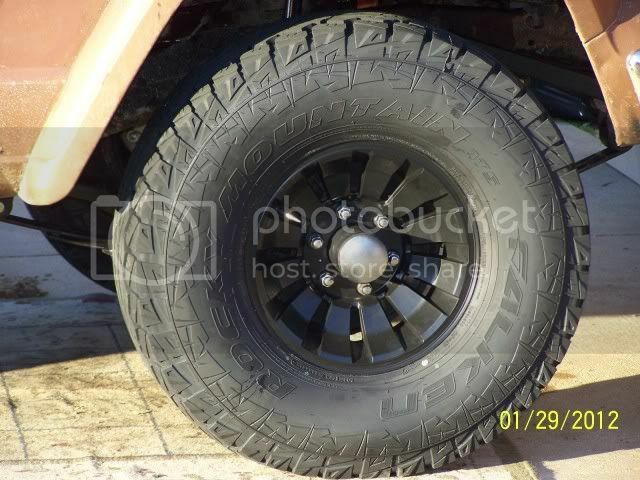 They were wrapped in Faulken Rocky Mountain ATS 33-12.5-15's. Paint was shot so we grabbed a case of flat black primer and murdered it. Motor was pulled early this summer and rebuilt. Should be going back in by mid Sept 2013. Edelbrock 2131 with a 4bbl, new radiator, new heater core and Skip White HEI dizzy should light the fires. True duals will be leaving stock manifolds and into Patriot Sidepipes. Hoping to have it buttoned up this fall as my son (owner/driver) will be taking the TANK on a one-way trip to the NW corner of Montana for a job. I'm excited and jealous for him!! Sweet looking Cherokee. 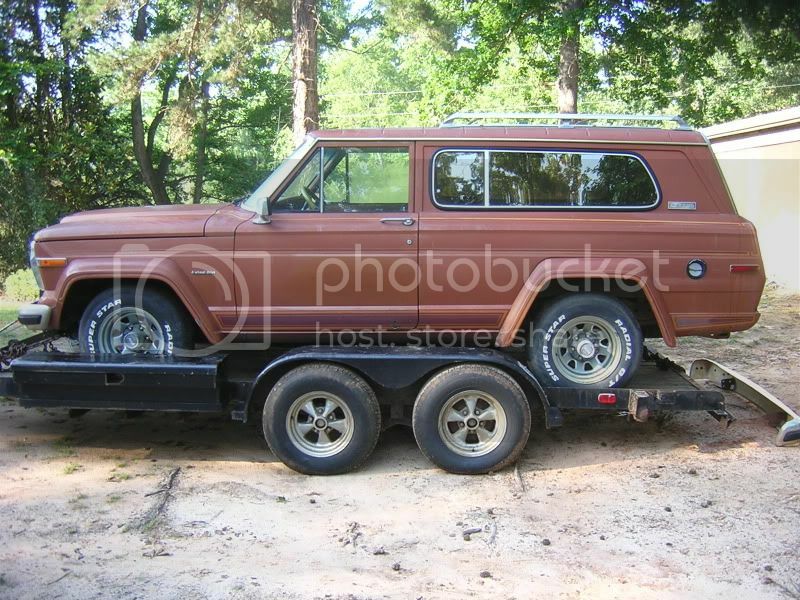 I just bought a 83 Cherokee Chief S and I'm going to do about the same thing you did. Add some more pictures when you get a chance. Texas is a smaller community so the forum gets less traffic. That is a nice Cherokee. I think that flat dark green is awesome. It looks like a thoroughbred hunting dog with that "I'm ready to go to work!" look on his face. EasTXJEEPER thats a nice rig you picked up.